It’s been a good year, for me, for Malaysian theatre. I liked the originality of concept, interactive nature, intimate settings and experimental nature of the shows I had seen in 2017. Crimson Curtain, by Lam Ghooi Ket: An original monologue by Lam Ghooi Ket, needed the artistry of a dancer, Sandhya Manoj, to bring this tale of a courtesan alive. The setting was in a room in GeethaSankaranLam Studio in Brickfields, and imaginative took flight in such a tight space! the director has to follow someone else’s lead. It was a time for fireflies to set alight the mind’s eye. Harold Pinter’s Betrayal, at Klpac in English and Bahasa Malaysia: Set in the Black Box, it was a rivetting watch as Omar Din, Razif Hashim and Stephanie Van Driesen took on cheating on your spouse. What is left unsaid as important as what is spoken. Wooo, isn’t just! 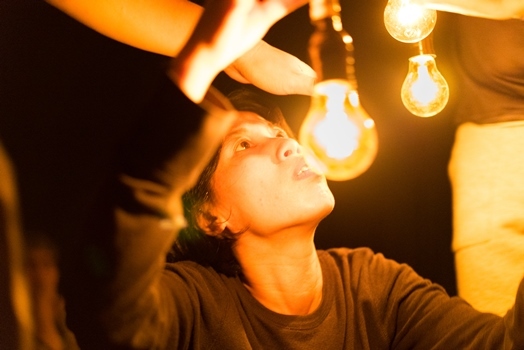 Losertown by Tung Jit Yang: Experiemental theatre at its best! Wild and exciting! Should there be a No 5? Well, there is Kee Thuan Chye’s Swordfish + Concubine: A dig at political scenarios through age-old Malay tales. Hot stuff!